Friday, June 8 | 7:00 - 9:00 p.m. 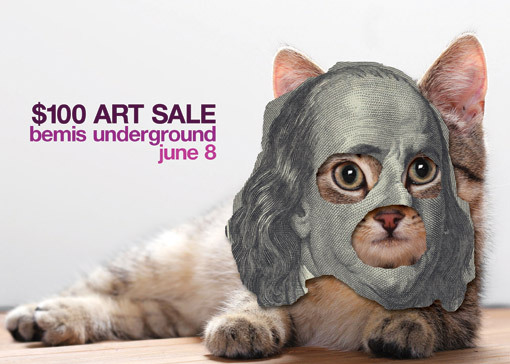 Description: The bemisUNDERGROUND's famous $100 Art Sale returns on Friday, June 8 from 7:00 to 9:00 pm. As the name implies, all the artwork at this frantic fundraiser is only $100. Admission is $10 at the door. The $100 Art Sale is a once-a-year opportunity to easily take home original work by exceptionally talented artists from across the country. All sales help the UNDERGROUND provide exhibition opportunities for emerging and regional artists in our community. In addition to the work for sale, select work will be raffled off for $10 per ticket. This event is strictly first-come, first-served. Last year the line started forming at 9:00 am, so guests are encouraged to arrive early. The bemisUNDERGROUND is an integral part of the arts community in Omaha. The space is dedicated to providing opportunities for regional artists to exhibit and creating a stronger community through ongoing dialogue about the arts. All proceeds from the event will support UNDERGROUND programs and exhibitions. As always, if you have any questions -- please feel free to contact Joel Damon, the UNDERGROUND Curator at joel@bemiscenter.org.